We’re very excited that the “Fresh! Chef-to-School” program is returning to the Waltham Public Schools for the 2016-2017 school year. 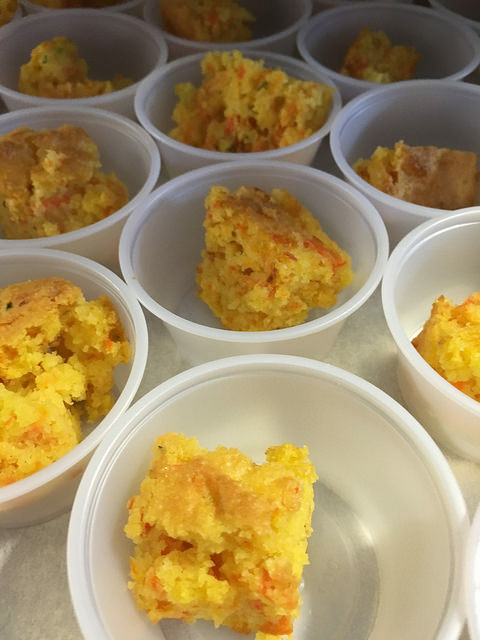 Continuing our partnership with the Waltham School Nutrition Department, Chef Reva will visit all elementary school cafeterias to work with cafeteria staff and encourage kids try new foods. The “Fresh! Chef-to-School” program helps to educate kids to make healthy food choices and promotes life-long healthy eating habits. We’re working to create new dishes that are both healthy and delicious, with an emphasis on local, seasonably available produce. After learning about the featured fruit or vegetable of the day, all kids get to try a sample. Favorite recipes may turn up as regular features on school menus! To make Healthy Waltham’s crowd-pleasing Confetti Cornbread, simply combine equal parts of your favorite cornbread/corn muffin mix (such as Betty Crocker, Arrowhead Mills, or Bob’s Red Mill) with grated vegetables such as carrots, zucchini, or summer squash (approximately 1 cup mix to 1 cup vegetables). Add water according to package instructions or until your desired consistency is reached – we tend to like ours on the thicker side! Then spread the mixture in a well-greased baking dish or use a muffin tin. Bake at 350F until golden brown on top and a toothpick comes out clean when inserted in the center, 20-25 minutes for cornbread, 15-20 minutes for muffins. The heat is on! It’s important to stay well hydrated during these hot summer days. While water is your healthy choice, when you crave something different, why not try a homemade beverage or smoothie? You can avoid the high calorie and sugar content of commercially prepared beverages like sodas or frozen coffee drinks. Plus, homemade tastes great! 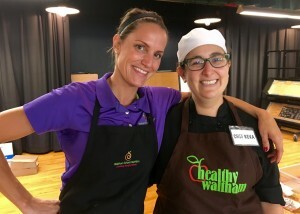 Healthy Waltham was delighted to hold our Healthy Kids Summer Program for the third consecutive year. This program is conducted in partnership with the Waltham Public Schools for special education students enrolled in the WPS summer school program. The program was sponsored by a grant from the Jones Partnership of the First Parish Church in Waltham. Healthy Waltham’s Chef/Program Manager Reva Haselkorn met with the middle school group four times this summer. The first lesson included a planting day in the McDevitt Middle School Garden. Kids cleared weeds and planted seedlings on one of the hottest days of the year! Then in July, kids got to learn more about growing vegetables and explore the school garden at the Northeast Elementary School. Waltham Fields Community Farm’s Education and Outreach Manager, Alex Lennon-Simon, led the tour of the garden. Then, students got to harvest herbs and vegetables to use in creating healthy snacks. The final day of the program, the students made healthy pizzas with creative veggie and herb toppings. Youth from the Waltham Fields Community Farm “Youth Crew” also assisted with the program. To see more photos, please click on the photo gallery. We had a great time at the Waltham Farmers’ Market in June talking to customers of the market about healthy eating and local produce! We partnered with the Waltham Fields Community Farm to share a table and offer a tasting of a yummy chopped salad with farm-grown mixed greens. The salad was topped with a zesty lime vinaigrette created by Chef Reva. You’ll definitely want to try this one! Combine dressing ingredients in a blender or food processor and blend until smooth. Adjust seasoning to taste. Toss greens and sliced vegetables with enough dressing to coat. Enjoy! Chef Reva’s Tip: “A successful dressing is all about balancing acidity, fat and salt. To adjust the seasoning of your dressing, dip a piece of lettuce or other greens into your dressing and eat (remember that salad greens are mostly water and will dilute the flavor of your dressing). If it tastes too acidic to you, add a little more salt and oil. If it tastes oily or bland, add more salt and lime juice. Always feel free to experiment by adding or eliminating spices, herbs, mustard, and/or nuts and seeds. We recently updated our popular City Walks Map. We feature the four most popular city routes in Waltham’s South Side. Walking is a great way to fit more exercise into your day in an accessible, no-cost way. Walking can help lower blood pressure, high cholesterol, and diabetes risk, while it boosts muscle and heart strength and improves mood. Why not get outside walking today! The map was developed in conjunction with the Waltham Land Trust which also has many more routes through Waltham’s open spaces on its website here.